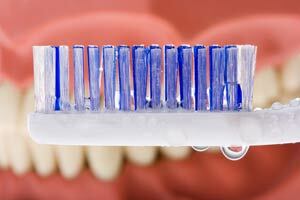 Use denture cleanser instead of toothpastes, which are too abrasive and will scratch your denture. Rinse with cold water. Have loose dentures checked immediately as they can cause friction and pressure on the gum tissues and bones, which can can cause further bone loss and poor fit. If you have complete dentures be sure to visit us once a year for an exam, oral cancer screening, and to have your dentures cleaned and evaluated. Patients with partial dentures should maintain their twice a year cleaning and exam appointments. Inspect your denture regularly for worn teeth. Worn and stained dentures can make you look older and cause your dentures to function poorly.